Which of the following regarding MPLS encapsulation for VPRN services is TRUE? The customer's Layer 3 header is removed at the iLER. The customer's Layer 2 header is removed at the eLER. The customer's Layer 2 header is removed at the iLER. The customer's Layer 3 header is removed at the eLER. Which of the following about the Link LDP discovery process on the Alcatel-Lucent 7750 SR is FALSE? LDP Hello messages are sent over TCP. Each LDP enabled router must have its own unique system IP address. LDP Hello messages are sent to the All Routers address 224.0.0.2. LDP Hello messages are exchanged between all directly connected LDP enabled routers. Which of the following devices assumes the active role during the establishment of an LDP session? The peer with the higher physical address. The peer that generated the first Hello message. The peer with the lower transport address. The peer with the higher transport address. The peer with the lower physical address. Which of the following messages is NOT used in T-LDP operation? Click on the exhibit.Which of the following is FALSE? The router can reach prefix 192.10.1.2/32 through a RSVP-TE tunnel. The Isp-ping tool is used to perform a unidirectional LSP test. The router can reach prefix 192.10.1.2/32 through an LDP tunnel. The router 10.10.10.2 is the egress router of the prefix 192.10.1.2/32. Which of the following about LSP path configuration on an Alcatel-Lucent 7750 SR is TRUE? The path must include at least one hop. The path must define a tunnel destination IP address. The path may be used for multiple LSPs. The path may be used multiple times in a single LSP. initiate to clear the RSVP session? 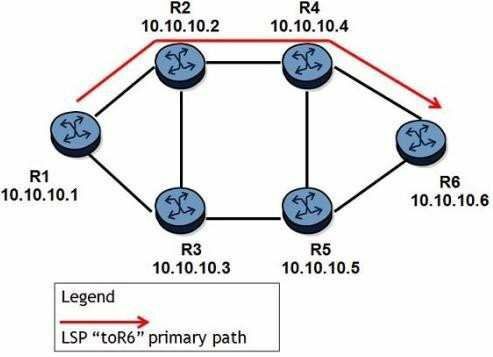 Send a PATH Tear message toward router R6. 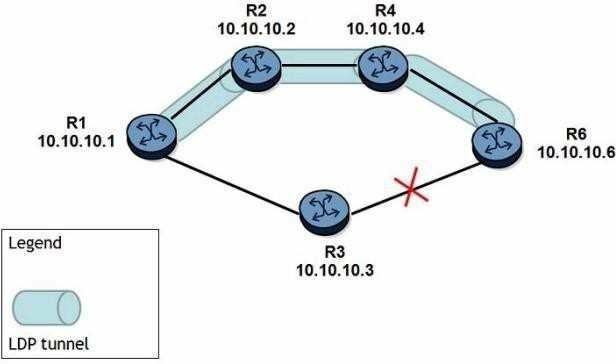 Send a PATH Error message toward router R1. 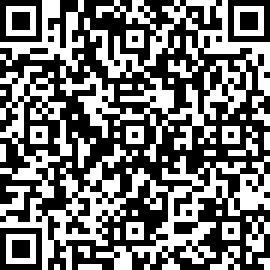 Send a PATH Tear message toward router R1. Send a PATH Error message toward router R6. Which of the following about CSPF is TRUE? The tail-end router performs the CSPF calculation for an LSP. Each downstream router performs its own CSPF calculation for an LSP. CSPF calculations are always performed on RSVP-TE based LSPs. The head-end router performs the CSPF calculation for an LSP. Which of the following describes 6PE? P routers run IPv4 only. PE routers run IPv4 only and exchange IPv6 routes using MP-BGP. P routers run IPv6 only. 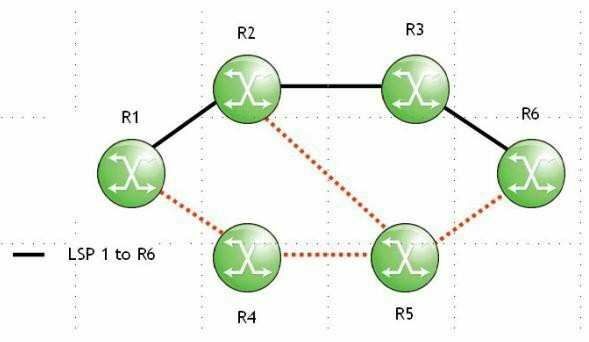 PE routers run IPv6 only and exchange IPv4 routes using MP-BGP. P routers run IPv4 only. PE routers run both IPv4 and IPv6 and exchange IPv6 routes using MP-BGP. P routers run IPv6 only. PE routers run both IPv4 and IPv6 and exchange IPv4 routes using MP-BGP. Enable the Idp-over-rsvp feature on all PEs and ABRs along the LSP tunnel. Configure T-LDP sessions with the tunneling option. Configure Link-LDP sessions between each PE-ABR and ABR-ABR pair. Configure RSVP-TE LSPs in each area between each PE-ABR and ABR-ABR pair. Enable traffic engineering on all routers along the LSP path. Enable MPLS and RSVP on all routers along the LSP path. Enable CSPF on the head-end router. 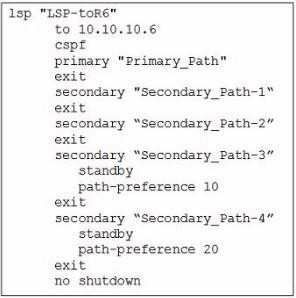 Configure a path definition on all routers along the LSP path. between R2 and R4 remains up, which of the following will affect the failure detection time? The time router R2 takes to receive a PATH Error message from router R4. The time router R2 takes to receive a PATH message from router R4 after a PATH refresh interval. The time router R2 takes to find out a number of RSVP Hello messages have been missed. The time router R2 takes to send a PATH Tear message to the head-end router. 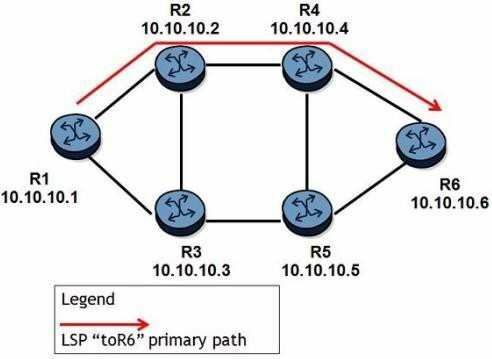 If the primary path goes down, which secondary LSP path will the head-end router select first? Facility fast reroute with node protection is enabled for an LSP, which of the following is FALSE? Each PLR signals a bypass tunnel that avoids the next-hop downstream router. The head-end router sets the local protection desired flag in the session attribute object. When a failure occurs, the PLR pushs an additional label onto the label stack. No bypass tunnel is established if the PLR cannot provide node protection. the LDP-IGP Sync feature enabled, what happens immediately after the link is restored? A new LDP session is established on R1-R3-R6 as soon as the FIB is updated. The LDP session remains unchanged until the existing path R1-R2-R4-R6 goes down. the same cost. Which of the following about DMP and MP is TRUE? R3 and R5 become DMPs; R6 becomes MP. R1, R3, and R5 becomes DMPs; R4 and R6 become MPs. R3 and R5 become DMPs; R4 becomes MP. R3, R5, and R6 become DMPs; R4 becomes MP. Which of the following defines an FEC in traditional IP? A group of packets that will be forwarded by the router in the same manner, over the same path. A group of packets that arrive at the router on the same interface, from the same source. A group of packets that leave the router on the same interface. Which MPLS mode saves only active label mappings received from peer LSRs?